What can we expect from the Samsung Galaxy S9? | What Hi-Fi? What can we expect from the Samsung Galaxy S9? 2K screens, faster processors, AKG stereo speakers, and Android animoji could come with the Samsung S9 and S9+ when they launch at the Mobile World Conference. Mobile World Conference is the second-most important event happening in February (the most important, of course, being the Sound and Vision Show in Bristol). 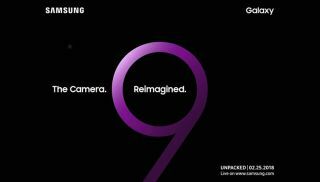 This is where many companies take the opportunity to show off their upcoming smartphones, but taking centre stage this year is Samsung's new Galaxy S9. Many of the S9’s features have already been leaked, and though Samsung has confirmed that we'll get the full details on 25th February, it's worth looking at what we know so far. The aim has been to refine the performance of the Galaxy S8, but we have a good idea that the design of the phone will remain similar. Xda-developers recently revealed 3D models of the phone, after a Reddit user hacked the Unpacked 2018 app Samsung put on the Google Play Store, which allowed users to view the phone in augmented reality. These models confirm that the Bixby button will remain, and the fingerprint scanner has been moved to under the camera, rather than beside it. There were rumours that the next generation of Samsung phones would have 4K displays, competing with Sony’s Xperia XZ Premium that came out last year. However, this seems unlikely – we expect similar specs to last year, with the Quad HD (2K) Super AMOLED on both devices. This is probably a smart move; it takes a lot of extra juice (therefore a bulkier battery) to power a 4K screen, so it’s worth forgoing the extra thickness and increased price. While the screen technology might not be new, the heart of Samsung’s new flagship phones will be. At CES 2018, the company announced the Exynos 9 Series 9810; this has the latest custom CPU – an “ultra-fast gigabit LTE modem and deep learning-enhanced image processing,” according to Samsung. This means that it will offer twice the performance of the Exynos 8895 used in the Galaxy S8, with a high clock speed (how fast the processor works) of 2.9GHz. Regarding the RAM, we expect to see 4GB in the S9 and 6GB in the S9+. Enhanced image processing also means we should see better face-identification software, and the potential of “realistic face-tracking filters” similar to the Animoji feature found on the iPhone X. For those more concerned with snapping photos, the S9 will have a single camera on the back, while the S9+ will get a dual-camera set-up. A report from Chinese site VTECH (via Neowin) suggests that the S9 will offer an adjustable aperture ranging from between f/1.5 and f/2.4. This could make the Samsung range closer to DLSR cameras than ever before. The tagline of the company’s announcement is 'The Camera. Reimagined', so we’re expecting much on this front. Reports suggest that the main camera will be 12MP, with an 8MP selfie camera. It looks like Samsung is persisting with the 3.5mm headphone jack, while VentureBeat also states that the phones will have AKG stereo speakers. This makes sense as AKG built the headphones for the Note 8. On the 3D renders, there is a hole at the bottom of the speaker grille. According to XDA-Developers, that's rumoured to be used as part of AKG's tuning for the Galaxy S9’s new dual speaker system. Finally, Samsung is offering a new iteration of its DeX docking station that can turn your phone into a PC-like experience when attached to a display. While the old version had the phone stand vertically, the new one lets the phone sit flat on the surface, so you can use the screen as a touchpad or virtual keyboard. Prices are unconfirmed as yet, but we would expect to see it starting between £700 and £730. The Galaxy S8 launched at £690, while the S8 Plus was £780. The Galaxy Note 8, meanwhile, came in at a hefty £880. While we don’t foresee the S9 costing quite that much, we hedge our bets with a small price increase. In addition to black, gold and blue varieties, there will be a new purple (or more specifically, lilac) colour option too. For everything else, we’ll have to wait until another few days. February 2018 issue on sale now! Win a Cyrus One amplifier, Chromecast Audio dongle and Tidal subscription!